SCVHistory.com LW3247 | Lebec | Emery Whilton's Florafaunium, Mult. Postcards, 1940s. F6714 — Exterior; earlier issuance than the others. W-1453 — Exterior; later issuance. W-1458 — "Sierra deer group." W-1460 — California condor (right), turkey vulture (left), raven. W-1462 — "Catalina Island wild goat and some shore birds." W-1463 — "Sierra mountain mammal group." One of the weirder footnotes in local history is Emery M. Whilton's short-lived Florafaunium, a public-private museum in Lebec. As the name implies, it housed a massive collection of stuffed animals and plants, mostly native to California. Whilton, born in Indiana in 1879, came to California in 1909 and settled in Tulare, where he opened a hotel in 1922. A hunter, he filled his hotel with a growing assortment of birds and mammals, most of which he shot himself — some of which, like the grizzly bear and California condor, became extinct or nearly so during his lifetime. Meanwhile, his daughter amassed a diverse variety of wildflowers. By the late 1930s, their accumulation of California flora and fauna was considered the most complete collection of its kind. 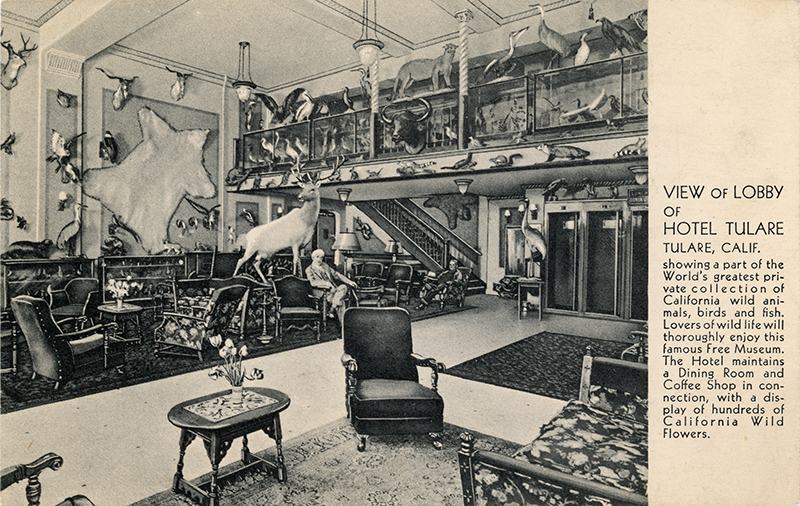 Faunal display in Whilton's Tulare hotel, 1920s-1930s. Back reads: Hotel Tulare is the only completely air-cooled Hotel between Madera and Bakersfield on U.S. Highway 99. Gateway to Sequoia and General Grant National Parks, half-way between Los Angeles and San Francisco, and also half-way between Los Angeles and Yosemite National Park. Emery M. Whilton, Mgr. Click to enlarge. In the late 1930s, Whilton shopped around for a new home for his collection, evidently seeking out the best deal. There were at least three suitors: General Grant National Park in Fresno and Tulare counties (renamed King's Canyon National Park in 1940); the county of Los Angeles; and the county of Kern. The latter won the day. On a controversial 3-2 vote, the Kern County Board of Supervisors agreed to acquire the San Joaquin Valley building from the Golden Gate International Exposition of 1939-1940 (San Francisco World's Fair) and move it from Treasure Island to Lebec. The owners of Hotel Lebec and the neighboring Richfield gas station donated the land to the county for that purpose. The property was located just south of the coffee shop, directly behind the California Historic Landmark plaque that was installed in 1938 for the Spanish explorer Pedro Fages. At a cost of $10,000, the building was dismantled in San Francisco and shipped to Lebec where it was reassembled by a county inmate crew. The Florafaunium opened in 1942 on the Ides of March. The county owned the building and Whilton owned the collection. The taxidermied animals were arranged in dioramas, or "habitats," replicating their natural settings. Under an operating agreement, Whilton charged admission of 25 cents for adults and 10 cents for children, paid 10 percent of proceeds to the county, and in 20 years the county would own the collection. It didn't take that long. Whilton died March 22, 1945, in Tulare, and his widow, Edna, took over the museum operation. But it wasn't profitable, and she wanted out. In 1949 she tried selling the collection to Kern County for $100,000 — her husband's estimated cost of amassing the collection over 30 years. The county balked. After nearly a year of negotiations, while the animal displays started to disintegrate, the county finally agreed on $10,000 and moved the collection to the Kern County Museum in Bakersfield, where Frank Latta was the museum director. Just as inmates had put it up, in 1955 another group of inmates took the derelict museum building down. Salvaged construction materials were given new life at the county jail farm. Los Angeles Times | September 22, 1932. Tulare, Sept. 21. 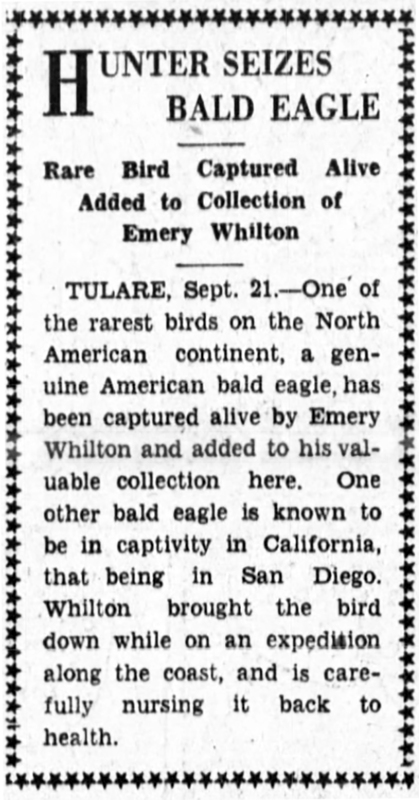 — One of the rarest birds on the North American continent, a genuine American bald eagle, has been captured alive by Emery Whilton and added to his valuable collection here. One other bald eagle is known to be in captivity in California, that being in San Diego. Whilton brought the bird down while on an expedition along the coast, and is carefully nursing it back to health. Fresno Bee | December 6, 1936. Tulare (Tulare Co.), Dec 5. — The champion large and small game hunter of the world. That is the title bestowed upon Emery Whilton, Tulare hotel owner and sportsman, by authorities on wild animal and bird life throughout the country. Whilton is the owner and proprietor of the Tulare Hotel. Inside the hotel is found perhaps the most interesting and remarkable achievement of its kind in the world. It is known as The Hotel Tulare Museum. In this museum is found a practically complete collection of mounted wild mammals, birds and flowers native to California. One of the remarkable things about this collection is that 99 per cent of all the birds and animals were personally bagged or trapped by Whilton himself. The museum is open to the public at all times free of charge. Whilton started his collection merely as a hobby, although, if he so desired, he could undoubtedly collect a tidy sum as an exhibitor. He says he would not accept $100,000 for his complete collection. At one time be was offered $75,000 for all rights to his museum but refused. The museum has attracted nation-wide interest, and tourists from every part of the country flop at the hotel to view the exhibit. More than twenty-seven years of Whilton's time was employed in gathering the collection. Recently he received a letter from the New York Times requesting an interview in connection with the museum. A short time ago the American Magazine printed an interesting article which outlined in detail the unusualness, size and completeness of the collection. "Emery Whilton has ridden his hobby horse to complete success, not only in regard to this positively remarkable achievement in the collection of wild animals, birds and flowers which are native to our state, but has made his hotel one of the most distinctive in the world. Every specimen of wild animal found in California, with the exception of three, is found in the Whilton collection. There are ninety known mammals native of California. One can see eighty-seven of them in one collection. In all, a total of 135 mounted animals native of this state are seen in the museum. As a novelty, for the benefit of his visitors, Whilton has included in his collection twenty wild animals and a number of birds foreign to the United States, from the king of the Jungle to the beautiful Bird of Paradise. An outsider of which he is extremely proud is a 2-hour-old Bengal tiger, captured by a well-known large came hunter and presented to Whilton some time ago. The Mexican jaguar, kin to the California mountain lion, is extremely hard to capture but Whilton, while on a hunting expedition in the southern part of Mexico, was fortunate to bag a fine specimen which is displayed in one section of the hotel. While hunting on the islands of the Santa Barbara Channel he was able to obtain several of the rare mountain goals and wild boars. Perched in life-like poses, on banister railings, balconies, in nooks and corners and even attached to the wall can be seen a multitude of California wild animals. To the right is a full-grown California brown bear, while above is crouched a bobcat. Directly ahead in the center of the lobby is a splendid specimen of the tule elk, which were being exterminated so rapidly some years ago that the government was forced to step in and take measures to preserve the band of some 200 that remained. A specimen that few collection owners are fortunate enough to have is the California sea otter, now extinct, which is displayed among the host of other native sons and daughters. At the extreme rear of the lobby, expertly arranged upon the banister of a balcony, are several of the smaller wild animals, among which can be seen the beaver, weasel, shrew, fisher, etc. Two excellent specimens of the beaver and fisher, both practically extinct, are the proud possessions of Whilton. Alongside is seen the smallest mammal in the world, the California shrew, seven inches in length. The weasel, which resembles the fisher in many respects, crouches down low with an evil glint in his eye, which gives the impression that a neighboring chicken coop has been spotted. In the left of the lobby entrance the first thing that attracts attention is a wonderful male specimen of the gorgeous southern wolverine. According to authorities, not over three or four are left in California. This is one of Whilton's most prized possessions. The only white fall deer found in a California museum holds its antlered head high as it stands in lordly poise in one section of the lobby. It was bagged by Whilton in the San Jacinto district, Riverside County. A great help to visitors of the Tulare Hotel are the identification cards attached to every animal and bird on exhibition. On these cards is stated the name, both scientific and common, date captured, by whom and where. When mountain lion is mentioned to Whilton he is all ears, for lion hunting is the biggest attraction in his busy life. He has exhibited in one part of his hotel the second largest mountain lion registered as caught in California. He bagged the animal, which measures over seven feet in length, while on a hunting expedition back of the Tule Indian Reservation. It was on this same trip that he brought down his first black bear. Inside of fifteen minutes after the lion was slain, a large fat black bear lumbered onto the scene and was brought down by Whilton's high-powered rifle. The birds and animals in this collection are protected from moths, insects, etc., by a special solution of arsenic which is injected into the skins and which is absorbed by the hair, thus protecting both the hair and hide. All taxidermy work is done by Floyd Baker and Gustave Gluckert of Los Angeles. Equally as complete as the animal collection is the wild bird assortment. Of the 604 wild birds found in California, 588 are included in the Tulare Hotel collection. Whilton says no other collection on record has such a complete assortment of California wild birds. The San Francisco Museum can boast of only seventy-six species. Whilton's bird collection, started twenty-seven years ago, received a terrible jolt when a disastrous fire destroyed his ranch home near Fresno and took with it every bird but one pair, a pair of while-faced glossy ives which now adorn his present collection. Undaunted by the fire, Whilton set to work and after many years can now sit back and say with satisfaction that where there is a will there is a way. In glass cases in several sections of the hotel can be seen displays of beautifully colored birds which are almost life-like in appearance. One of the features of this collection is a black and short-tailed albatross, an odd looking bird, extremely hard to find. The California water turkey, now extinct, it found included among the exhibition of the wild fowl life. The tiny humming bird can be seen perched upon a sprig beside a mother quail with her two youngsters. Whilton was forced to make fifty trips to find the red bellied hawk. One of its kin, the fish hawk, fastest flying bird in the world, adorns the entrance to the bird department. There are sixteen species of the hawk found in California. Every one is on display here. Contrary to general belief, Whilton says, of the thirty-seven species of the hawk found in the United States, thirty are beneficial and the remaining seven are as beneficial as they are harmful. Some of the birds obtained by Whilton which are now extinct are the American golden eye, harlequin and king eider. A beautiful specimen of the emperor goose, which is also extinct, is included among the birds. No other museum in the country is recorded as having in its possession an emperor goose, either dead or alive. The only collection in the world which includes all of the twenty-eight species of ducks found in California is possessed by Whilton. Every duck from the great mallard to the small but tasty teal can be found in the collection. While hunting near Bakersfield some time ago Whilton was amazed when he bagged what he supposed to be an ordinary quail. When it was examined it turned out to be an albino quail, pink and white in color but perfect in size and weight. According to California bird experts, there never has been a bird such as this registered as caught in the state. An oddity which attracted the attention of many scientists of California universities is a brown and white dove which Whilton includes in his collection. Whilton also has a white headed meadow lark which he shot near Tulare. Not exactly an oddity but nevertheless unusual is a mounted murre caught by Whilton along the coast. The murre, a California ocean bird, has been practically extinct for a number of years and, accenting to the California Fish and Game Commission, there are only a very few left, twenty at the most. Years ago it was nothing unusual to see thousands of these birds feeding along the shore line. "The great horned owl is on enemy to man, the jay eats beneficial bird eggs and young birds, and the sapsucker punctures orchard trees, which in many cases means the death of the tree. The sapsucker is not to be confuted with the woodpecker, which is a conserver of foliage. Quail, meadow lark and the house wren all feed upon harmful insects of the cultivated fields. Active weed destroyers are quail, dove, cowbird, red winged blackbirds and the sparrow. "The same condition of extinction is found in the case of mammals which have been pitifully depleted by firearms in recent years. The buffalo and tule elk are examples of wild animal extinction in California. Had it not been for the government, which intervened, the tule elk would be a thing of the past. "People seldom realize the folly connected with idly picking wild flowers and carelessly casting them aside. Flowers by the number are forced to extinction each year on account of this. The sunflower, red bud and yucca are a few of the flowers and shrubs protected by the government." Last, but certainly not last, among the wonders of the Tulare Hotel Museum is the wild flower collection, which is made up of flowers found only in California. The collection was started by Whilton's daughter and nine years ago he joined her and the collection is now a partnership. There are 4,300 varieties of wild flowers found in California. In the Whilton collection can be seen 3,200. A flower gathered by Whilton is never put into a frame until it is first verified by state botanists. On his many trips in search of wild flowers Whilton has had his efforts rewarded by discovering several flowers for which state botanists have no classification. Every room in the hotel has several of these flowers mounted in frames on the walls. The majority of the collection is found in the coffee room, where they adorn the walls and can be viewed by the customers. Every flower is carefully pressed, fumigated and preserved before it enters a frame. An identification card accompanies the frame, upon which is listed the name of the flower, both scientific and common, where found, by whom and when. A number of flowers have been acquired recently for the collection and only remain to be mounted in their attractive frames. Whilton is an interesting and colorful character himself. Friday the thirteenth is his lucky day. He was born on Friday the thirteenth at Vevay, Ind., thirteen miles from a railroad. He cites the fact he was also married on the thirteenth. [Fun story, but his death notice says he was born in February 1879. The 13th was a Thursday.] He supervised the building of the Tulare Hotel in 1921 and took active charge of it in 1925. He is an active member of the Elks Lodge, Rotary Club and chamber of commerce. The Tulare conservation exponent is an ex-regional vice president of the Southern California Hotel Mens Association, a former member of the board of governors of the organization, ex-president of the San Joaquin Valley Hotel Council, ex-president of the California Hotel Greeters Association and ex-president of the San Joaquin Valley Tourist and Travel Association. He was chairman of the first meeting ever held in regard to the establishment of the International highway running from Point Barrow, Alaska, to the Straits of Magellan. The meeting was held in Yreka, December 2nd, 1929. As an active instigator of conservation in California, he frequently is in demand as a speaker. Los Angeles Times | February 24, 1939. Gift to the County Museum at Exposition Park of a floral, bird and mammal collection valued at more than $200,000 was predicted yesterday by [Los Angeles County] Supervisor John Anson Ford. The collection, owned by Emery Whilton of Tulare, took about 27 years to gather. It is comprised of almost every specimen of flower, bird and animal found in California, and cost $100,000 to collect. Whilton has been considering for some time the donation of the entire collection to the county, Ford said. The Board of Supervisors has agreed to house the collection in the museum. All that is needed to bring the collection here, Ford said, is to have Whilton confer with the board of governors of the museum to determine conditions for the bequest. Washington officials, the Supervisor explained, are making efforts to have the collection placed in the recently proposed Kings River National Park. "It seems to me that locating this collection in Los Angeles would bring a larger return in the way of education and enjoyment than if it were housed in the proposed national park," Ford said. Ford said he hopes Whilton may be retained in some custodial capacity by the museum governors, so that the owner will be assured of the collection's protection if it is donated. United Press (International) as published in Nevada State Journal (Reno) | January 11, 1940. Tulare, Cal, Jan. 10 (U.P.) 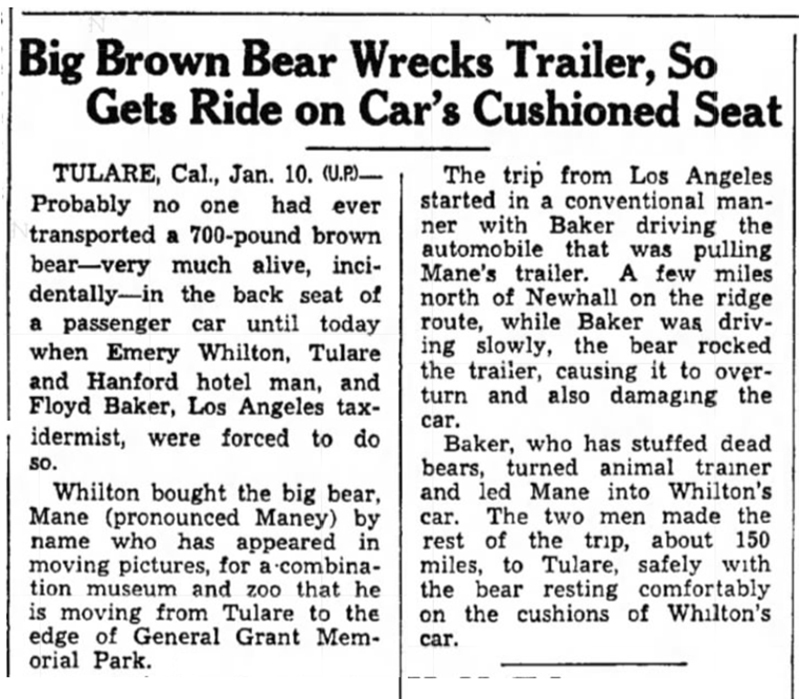 — Probably no one had ever transported a 700-pound brown bear — very much alive, incidentally — in the back seat of a passenger car until today when Emery Whilton, Tulare and Hanford hotel man, and Floyd Baker, Los Angeles taxidermist, were forced to do so. Whilton bought the big bear, Mane (pronounced Maney) by name, who has appeared in moving pictures, for a combination museum and zoo that he is moving from Tulare to the edge of General Grant Memorial Park. The trip from Los Angeles started in a conventional manner with Baker driving the automobile that was pulling Mane's trailer. A few miles north of Newhall on the ridge route, while Baker was driving slowly, the bear rocked the trailer, causing it to overturn and also damaging the car. Baker, who has stuffed dead bears, turned animal trainer and led Mane into Whilton's car. The two men made the rest of the trip, about 150 miles, to Tulare, safely with the bear resting comfortably on the cushions of Whilton's car. Bakersfield Californian | November 26, 1940. Wild-life specimens collected by Emery Whilton of Tulare over a long period of years will be brought to Kern county and housed in the recently acquired San Joaquin valley building, to be brought here from Treasure Island and placed at Lebec. Decision to place the building at Lebec, adjoining the hotel on the west side of the highway, had been reached informally by the [Kern County] Board of Supervisors today following a lengthy discussion at their meeting yesterday. It was decided previously to locate the building on county-owned property on Highway 99 near the overpass north of Bakersfield. Tentative plans called for using the building to house the Kern County Chamber of Commerce for the museum recommended by the Kern County Historical Society. The board was informed, however, by the historical society that it would require a fireproof building to house a historical collection. The chamber of commerce said the building would be unsuitable for an office and recommended that it be placed at Lebec to house the Whilton collection. Arrangements reportedly were being made today by C.E. Chapman, representing the Lebec Hotel Corporation, for a 99-year lease on the hotel property for the county. Mr. Whilton and the county, still in the informal stage, provide that the collection shall revert to the county after a 20-year period and that the county shall receive 10 per cent of the receipts at the museum. The Lebec building also will house a chamber of commerce information bureau. Including wild flowers in addition to rare specimens of California wild life, the Whilton collection has been valued at $200,000. An immediate decision was reached on location of the building because the first load of material from the dismantled structure is expected to arrive in the county tomorrow. Bakersfield Californian | November 29, 1940. Decision of a majority of the [Kern County] Board of Supervisors to place the San Joaquin valley building at Lebec for housing Emery Whilton's wild-life collection was sharply criticized today by Supervisor Ralph Lavin. Supervisor Lavin said he opposed the transaction at the supervisors' meeting and that the decision was made informally after the meeting had ended. "I am opposed to buying this building and placing it on private property for the use of a private business," said Supervisor Lavin. "It amounts to spending public money to set a man up in private business. "Not only is this the case but the wild-life collection will be so distantly located that it will be of little benefit to the citizens of Kern county who are paying the bill." Supervisor Lavin said the total cost of buying and moving the San Joaquin valley building from Treasure Island to Lebec, reassembling and erecting it would be nearly $10,000. "A better use for this money would be as a sponsor's contribution on a WPA building, which would provide the county with a much more valuable and substantial building," he declared. "Or it could be used in making an 18-hole course out of the Kern River Golf Course." The supervisors agreed to locate the building by Hotel Lebec and to allow Emery Whilton to use it in return for 10 per cent of the receipts, on condition that the collection, valued at $200,000, shall revert to the county after 20 years. Bakersfield Californian | December 23, 1940. 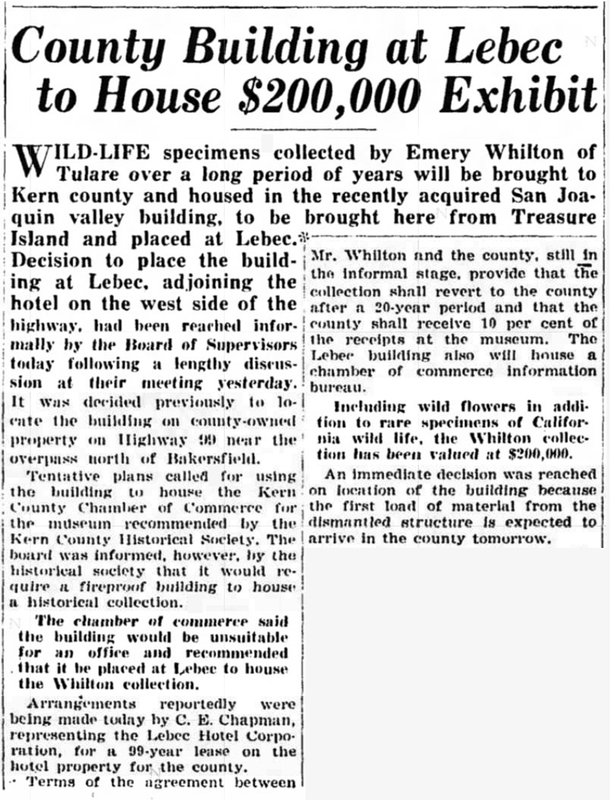 Carrying out a verbal agreement reached several weeks ago, the [Kern County] Board of Supervisors voted 3 to 2 today to approve a written contract allowing Emery Whilton and Edna Whilton, his wife, use of a county museum building at Lebec to house the famous Whilton collection of California wild life. The agreement provides that the collection shall become the property of Kern county after 20 years. Meanwhile, the Whiltons will have the privilege of using the building and charging 25 cents admission for adults and 10 cents for children wishing to see the exhibits. Ten per cent of the gross receipts will be paid to the county. Under terms of the agreement, the collection is to be known as "The Emery Whilton Flora-Faunaium [sic] Exhibit." The building to be used is the San Joaquin valley building, which has been transported here from the San Francisco Fair. It will be reassembled and erected on a site adjoining the Lebec hotel. A deed granting the property was received today from the New Lebec Hotel Corporation, Richfield Oil Corporation and the Title Insurance and Trust Company and was ordered recorded. 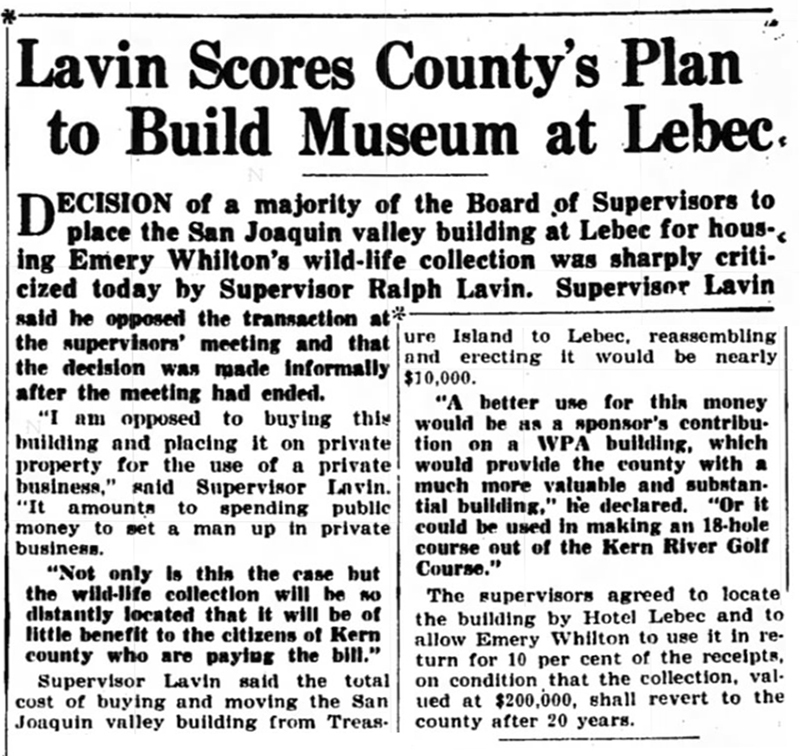 Supervisors Ralph Lavin and Charles W. Wimmer, who have been opposed to establishing the building and wildlife collection at Lebec, voted against the Whilton agreement. Bakersfield Californian | February 3, 1941. 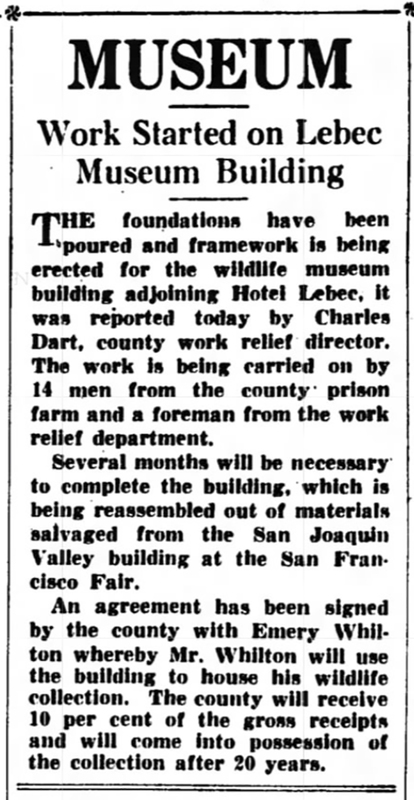 The foundations have been poured and framework is being erected for the wildlife museum building adjoining Hotel Lebec, it was reported today by Charles Dart, [Kern] county work relief director. The work is being carried on by 14 men from the county prison farm and a foreman from the work relief department. Several months will be necessary to complete the building, which is being reassembled out of materials salvaged from the San Joaquin Valley building at the San Francisco Fair. An agreement has been signed by the county with Emery Whilton whereby Mr. Whilton will use the building to house his wildlife collection. The county will receive 10 per cent of the gross receipts and will come into possession of the collection after 20 years. Bakersfield Californian | March 11, 1942. Whilton's Florafaunium of Kern County, which will be opened Sunday afternoon at 2:30 o'clock at Lebec with one of the most complete collections of wild life in the world, constitutes the life work of one man, Emery Whilton, longtime hotel man of Hanford and Tulare. In the structure, erected from the dismantled $75,000 San Joaquin Valley building on Treasure Island, will be housed more species of wild life than in all museums of the state combined, the creator of the collection said on a visit here recently. The specimens, most of them shot by Mr. Whilton since 1909, include extinct animals and birds, ranging from the 100 per cent extinct grizzly bear of Wyoming to the last passenger pigeon. More than 1,700 varieties of wild flowers found in California have a place in the collection. In the floral feature Mr. Whilton was assisted by his daughter. The 422 species of California wild birds he bagged mostly himself. He is proud of his European teal duck, not seen in California in 60 years, also the whooping crane and California condor with a wider wing-spread than the famed condor of the Andes. The flora and fauna authority is enthusiastic over the museum's location, which is in front of Hotel Lebec on Highway 99, and plans to live in a new house he has built for himself and Mrs. Whilton there. "The location is a year-around place, has good elevation, is a natural meeting place for the life zones and is close to historic Fort Tejon," he explained. He is sure the present quarters will not be large enough, predicting that a double amount of room will be needed. As might be suspected of an authority on plant and animal life, Mr. [Whilton] is in constant demand as a speaker. In fact he won five public speaking contests. He veers often from the flora-fauna subject, however, preferring to attack such topics as the qualities of agreeability, loyalty, dependability, resourcefulness or the subject of compensation. The museum will belong to Kern County after 20 years, and in the meantime Kern County will receive 10 per cent of the gross receipts. The project is county-sponsored, and county crews did the assembling of the building, it is reported. In addition to the throngs of Kern folk expected Sunday, there will be scores of hotel men and women, naturalists, flower lovers, sportsmen and hunters. Bakersfield Californian | March 14, 1942. The opening of the Emery Whilton Florafaunium at Lebec tomorrow at 2 p.m. will give to the public an exhibit that is the most complete of its kind in existence. "The Star-Spangled Banner," East Bakersfield High School boys' quartet composed of Ray Rogers, Joe Lee Louis, Duane Cline and John Overholtzer. Introduction of Supervisor A.W. Noon; welcoming address and introduction of guests by Mr. Noon; introduction of Thomas McManus: "I Love You, California," E.B.H.S. trumpet quartet; presentation of museum key to Emery Whilton; remarks by Mr. Whilton. Guests will include Supervisor Charles W. Wimmer, Judge J.R. Anderson, Warner L. Marsh, deputy director of natural resources representing Governor Olson, Secretary-Manager M.P. Lohse of the Fresno Chamber of Commerce, Former Supervisor George Parish, Ardis Walker, Mr. and Mrs. Frank Butler of Lebec, W.H. Hitchcock of Shafter, and Mrs. Lewis A. Burtch. Admission to the Florafaunium will be free to the public on the opening day, according to an announcement by Mr. Whilton and Secretary-Manager Emory Gay Hoffman of the Kern County Chamber of Commerce. In the large lobby of the Florafaunium is a huge bas-relief map of the San Joaquin valley, set in the rotunda, showing the mountain ranges, valley, oil fields, cities, towns and rivers in scale. On the main floor are the animal and bird habitats, fronted with plate glass and faced with redwood slabs. The deer habitats alone occupy one entire end of the building. The San Joaquin Valley group contains 84 varieties of animals and birds found in the valley. In this group are to be found foxes, wildcats, coyotes, badgers, weasels, skunks, otters, larks, pheasants, orioles, finch, geese, 28 varieties of ducks alone and eagles. Thirty-one varieties of all the hawks found in California are contained in a habitat of their own. In the crane habitat are a very rare pair of herons, the Louisiana heron and the little blue heron. A pair of whooping cranes, now considered extinct but once common in the Sacramento valley, are also on display in the same habitat. Fourteen different varieties of owls occupy a separate habitat. Coachella valley is represented with 75 different varieties of birds and animals, common to the valley. Among the group are wood ibis, rare roseate spoonbills, chuckwallas, swallows, quail, lizards, coyotes and bobcats. A habitat with an ocean scene, depicting the Morro bay coast with the surf breaking over the rocky shore has for its occupants seals, pelicans, sea gulls, hooded mergansers, grebes, terns and cormorants. The Catalina habitat also has a coastal scene for a background and in the foreground is the silver-tipped goat familiar to the island. Foxes, bald eagles, men-of-war birds, the parrot-like puffin, a short-tailed albatross and a black albatross are the other inhabitants of this group. The mountain sheep habitat has for its lone occupant a stone mountain sheep with its massive horns, poised on a rocky shelf against a background of the far-distant, snow-covered Sierras. In the large habitat of the great valley stands a magnificent specimen of a huge buffalo with a yearling at its side, both seemingly on the alert for the silver-tipped grizzly and a California mountain lion in the foreground. An antelope is also in this scene, an animal which once grazed in immense herds in the valley. The large collection, gathered during many years by Emery Whilton, is housed in the county-owned building on grounds donated by Frank Butler and C.A. Chapman of the Lebec hotel. On the mezzanine floor there are 1,700 varieties of California wild flowers, arranged in family groups, showing scientific names as well as common names, the date found and the locality. Elk Appear Lifelike — Standing amid trees, rocks and shrubs placed against painted backdrop to give realistic appearance, these three Roosevelt elk form one of [the] dioramas. In Lebec Florafaunium. The antlered males were shot by Mr. Whilton in Humboldt county and are shown in their natural habitat of tree-covered rocky ground along the northern California coast. Rocky Mountain Elk — Male Rocky mountain elk, rear, female, left foreground, and offspring. This is the largest deer in California. Twelve-Foot Wingspread — Giant condor, one of [the] birds in Whilton wildlife exhibit at Lebec Florafaunium, opening March 15, is specimen of world's largest flying bird. A few specimens of nearly extinct bird are occasionally seen in mountains northwest of Kern, one of few remaining habitats. Condor has 12-foot wingspread. Bird in exhibit was taken by Mr. Whilton in San Luis Obispo county. In lower left-hand corner is California turkey vulture, familiar "buzzard" often seen in Kern. Note comparison in size between vulture and condor. Florafaunium exhibits are presented in natural surroundings. Mountain sheep make realistic scene at florafaunium. Bakersfield Californian | March 16, 1942. [Caption] Attend Dedication — Shown in lobby of Whilton Florafaunium at Lebec is part of crowd of 325 which attended formal dedication of county museum Sunday. Building houses 1,700 varieties of wild flowers, nearly all examples of state's animal life, and is considered most complete collection of its kind in state. With snow-covered mountains lending color to the occasion, the dedication of the Emery Whilton Florafaunium occurred yesterday at Lebec at 2 p.m. as the doors of the unique new museum, housing the world's largest collection of California flora and fauna, were opened to the public. A total of 325 persons visited the exhibit during the opening ceremonies. 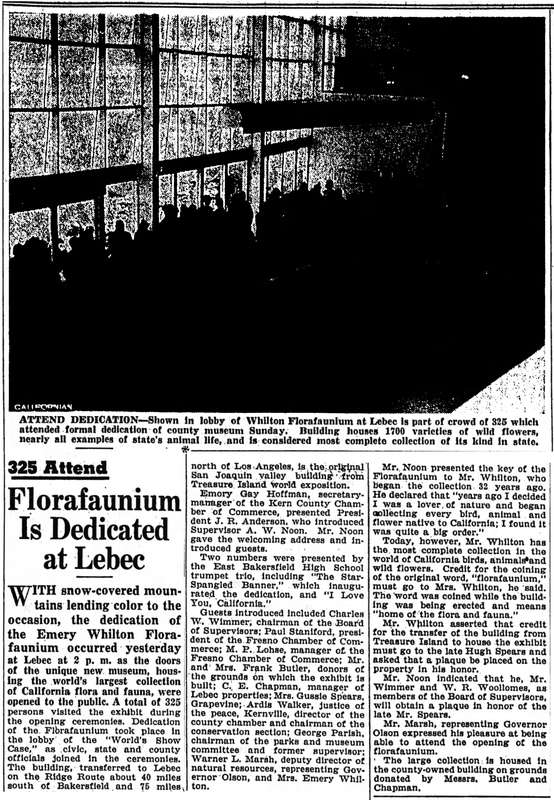 Dedication of the Florafaunium took place in the lobby of the "World's Show Case," as civic, state and county officials joined in the ceremonies. The building, transferred to Lebec on the Ridge Route about 40 miles south of Bakersfield and 75 miles north of Los Angeles, is the original San Joaquin valley building from Treasure Island World exposition. Emory Gay Hoffman, secretary-manager of the Kern County Chamber of Commerce, presented President J.R. Anderson, who introduced Supervisor A.W. Noon. Mr. Noon gave the welcoming address and introduced guests. Two numbers were presented by the East Bakersfield High School trumpet trio, including "The Star-Spangled Banner," which inaugurated the dedication, and "I Love You, California." Guests introduced included Charles W. Wimmer, chairman of the Board of Supervisors; Paul Staniford, president of the Fresno Chamber of Commerce; M.P. Lohse, manager of the Fresno Chamber of Commerce; Mr. and Mrs. Frank Butler, donors of the grounds on which the exhibit is built; C.E. Chapman, manager of Lebec properties; Mrs. Gussie Spears, Grapevine; Ardis Walker, justice of the peace, Kernville, director of the county chamber and chairman of the conservation section; George Parish, chairman of the parks and museum committee and former supervisor; Warner L. Marsh, deputy director of natural resources, representing Governor Olson, and Mrs. Emery Whilton. Mr. Noon presented the key of the Florafaunium to Mr. Whilton, who began the collection 32 years ago. He declared that "years ago I decided I was a lover of nature and began collecting every bird, animal and flower native to California; I found it was quite a big order." Today, however, Mr. Whilton has the most complete collection in the world of California birds, animals and wild flowers. Credit for the coining of the original word, "florafaunium," must go to Mrs. Whilton, he said. The word was coined while the building was being erected and means "home of the flora and fauna." Mr. Whilton asserted that credit for the transfer of the building from Treasure Island to house the exhibit must go to the late Hugh Spears and asked that a plaque be placed on the property in his honor. Mr. Noon indicated that he, Mr. Wimmer and W.R. Woollomes, as members of the Board of Supervisors, will obtain a plaque in honor of the late Mr. Spears. Mr. Marsh, representing Governor Olson expressed his pleasure at being able to attend the opening of the florafaunium. The large collection is housed in the county-owned building on grounds donated by Messrs. Butler and Chapman. Bakersfield Californian | April 28, 1942. Mana, 500-pound bear and newest prize possession of the Lebec florafaunium, sent her new master to the hospital today. 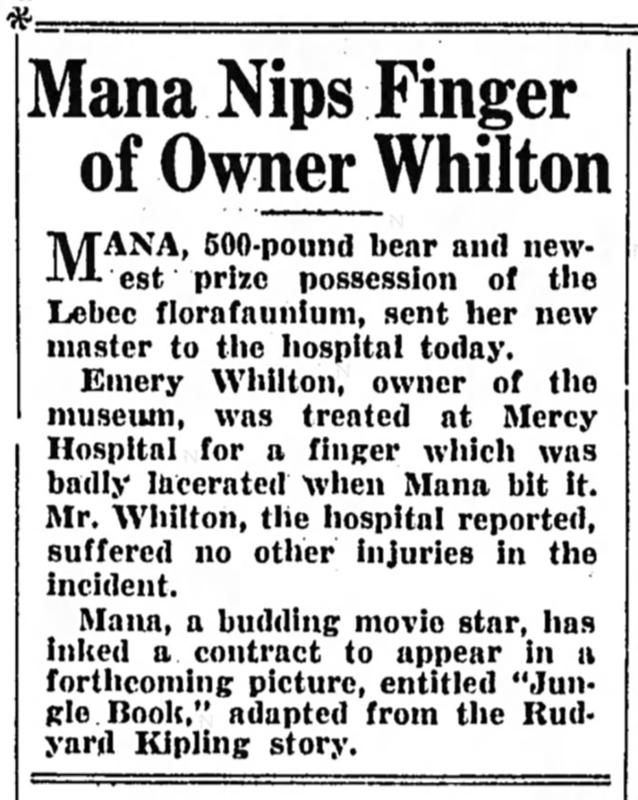 Emery Whilton, owner of the museum, was treated at Mercy Hospital for a finger which was badly lacerated when Mana bit it. Mr. Whilton, the hospital reported, suffered no other injuries in the incident. Maun, a budding movie star, has inked a contract to appear in a forthcoming picture, entitled "Jungle Book," adapted from the Rudyard Kipling story. Bakersfield Californian | March 23, 1945. Emery Whilton, 66, who established the Kern county flornfaunium at Lebec in 1942, died Thursday [March 22] at his home in Tulare, it was announced here today. Funeral arrangements are pending. Mr. Whilton was a prominent San Joaquin valley hotel man and collector of natural specimens in all fields of wild life. He is credited with owning some of the most outstanding collections in the west. The Kern county florafauniun was opened to public at Lebec [on] March 15, 1942, and brought together many specimens of Kern county wildflowers. The flora exhibit alone contained more than 150 items. Mr. Whilton owned the Hotel Tulare and until last summer, the Hotel Whilton in Hanford. He compiled Fresno's first city directory. He was born in February 1879 in Vevay, Ind., and came to Fresno 38 years ago, later residing in Los Angeles. He lived for a time in Bakersfield and later returned to Hanford and then to his home in Tulare. Mr. Whilton is survived by his widow and two daughters and a sister. Bakersfield Californian | April 26, 1946. Representatives of chambers of commerce from the 11 San Joaquin valley counties and delegates from northern and southern California will convene Saturday night and Sunday at Lebec in a conference to "determine the value of the Emery Whilton Florafaunium as a guest house and information center." This was announced today by Emory Gay Hoffman, manager of the Kern County Chamber of Commerce and vice-president of the state association, representing the San Joaquin valley. Kern county will be host to the chamber of commerce representatives at the Lebec meeting, according to Mr. Hoffman, who said that 50 reservations already have been made. The florafaunium was informally reopened this year after a wartime lull. It was officially dedicated on March 16, 1942 [sic: March 15], with civic, state and county officials participating in the ceremonies. Mr. Hoffman estimates that some 500 cars daily have stopped since V-J Day to inspect the floraunium [sic], which is located on Highway 99, 40 miles south of Bakersfield and 75 miles north of Los Angeles. Collection of the flora and fauna contained in the building was begun more than 32 years ago by the late Emory Whilton, naturalist. Norman Holt of Hanford, president of the San Joaquin Valley Association of Civic Organization Secretaries, will preside at the two-day conference in Lebec. Bakersfield Californian | June 7, 1949. [Kern] County operation of the Emery Whilton Florafaunium, a museum housing the world's largest collection of California plant and animal life, was offered Monday by Mrs. Emery Whilton, widow of the late naturalist. Mrs. Whilton met in Lebec with members of the Board of Supervisors, recreation and cultural commission and county museum to discuss the future of the Florafaunium. She said her late husband spent over 30 years gathering the unique collection of California flora and fauna. Some of the exhibits featured in the museum are either now extinct or are rapidly becoming extinct. The building housing the collection was constructed originally as the San Joaquin valley building at the Golden Gate International Exposition. The building was dismantled at Treasure Island and brought to Lebec to house the museum, which is located on Highway 99 in front of Hotel Lebec. Under terms of the county's agreement, the collection was to become the property of the county after 20 years. Mrs. Whilton said she is willing to accept an offer now from the county instead of waiting for another 12 years. "I don't want the responsibility any longer," she told county officials. "I'd like either an offer from the county regarding the future operation of the Florafaunium, or to work out some arrangement with someone else." Supervisor A.W. Noon asserted the county realizes the value of the collection and some steps should be taken to preserve it. As a commercial venture, the Florafaunium is a losing proposition, Supervisor Ardis M. Walker contended. Its greatest value from a county standpoint lies in its scientific and educational value, he said. The Florafaunium, the supervisor added, is not as important from a tourist's standpoint as it is from an educational and scientific level. Mrs. Whilton claimed tourists who have visited the museum have been highly impressed with the collection. "My husband spent thousands of dollars to gather the collection, and it is a source of satisfaction to me to listen to the reactions of visitors who recognize his achievement," she declared. Supervisor Noon said the board would name a committee, including representatives of the museum and recreational and cultural commission, to meet with the board regarding an offer for the operation of the Florafaunium for the next 12 years. Mrs. Whilton said she would appreciate a decision on Kern county's policy for the museum within the next 60 days. Bakersfield Californian | March 21, 1950. Payment of $10,000 for the Emory Whilton Florafaunium was recommended yesterday by a county committee in its report to the Board of Supervisors. Otto Kamprath, committee chairman, told the supervisors his committee considered the offer of Mrs. Edna Whilton to be a bargain. He recommended accepting her proposal to pay $5,000 in cash and $1,000 a year for five years to obtain full control of the exhibit at Lebec. The collection of bird and animal life, and framed hangings of every type of flower and grain in California was the life's work of Emory Whilton. 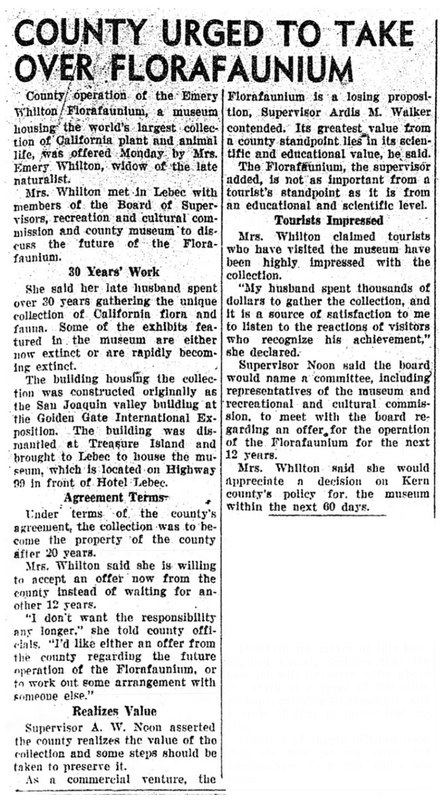 It [the building] was moved from the San Francisco exposition to Lebec, at a cost of $85,000, and the widow of the collector given a 20-year lease to operate the Florafaunium on a pay-as-you-enter basis. That was in 1942 and business has been so poor since Mrs. Whilton has been looking for a buyer. She asked for $100,000 but months of dickering lowered the price. 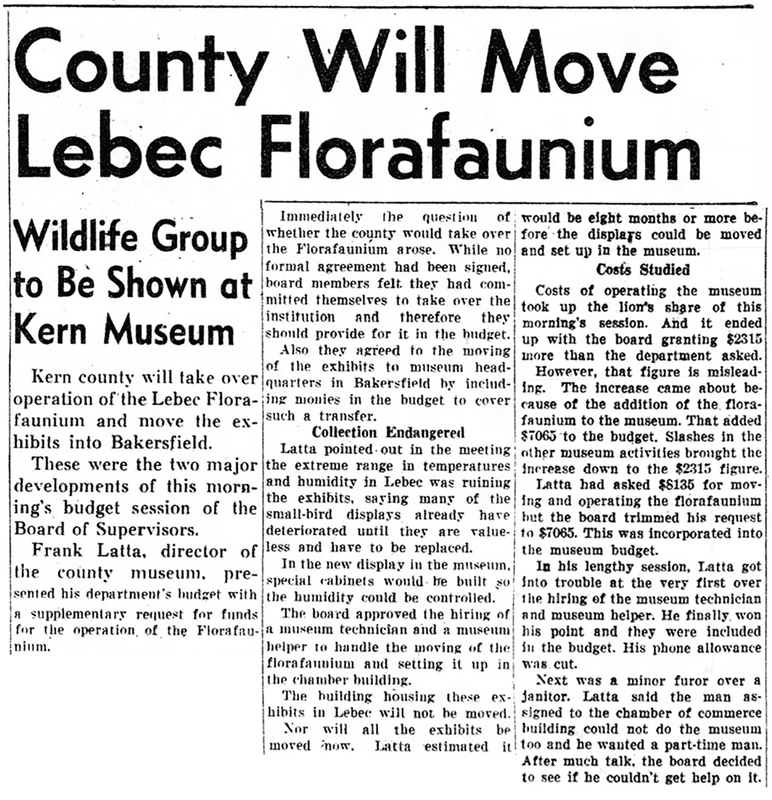 A recent report that the collection at Lebec would be worthless in another five years unless the county took action to preserve the exhibits caused Supervisors to set up a nine-man committee to investigate the Florafaunium. Named with Kamprath were Walter Mansfield, administrative officer; John E. Loustalot, sheriff; Norbert Baumgarten, county counsel; A.W. Noon, supervisor; Frank Latta, head of the county museum; Harry Hopkins, Dr. Elliott McClure and Glendon Rodgers. The committee would set up a budget of $10,475 for the first year. This could be slashed by at least $500 if the collection of flora and fauna comes under the control of the museum, Kamprath reported. Yearly salary of $4,500 for an ornithologist is the main item on the proposed budget. Material for construction of habitats would add $1,250; work on specimens another $500; building maintenance $500 and $2,000 for salary for a utility man. County educators would like the collection moved to the Bakersfield area where it would be "a million dollars worth of information" to the 50,000 school children who could benefit by the exhibits. Bakersfield Californian | April 27, 1950. Kern county will take over operation of the Lebec Florafaunium and move the exhibits to Bakersfield. These were the two major developments of this morning's budget session of the Board of Supervisors. Frank Latta, director of the county museum, presented his department's budget with a supplementary request for funds for the operation of the Florafaunium. Immediately the question of whether the county could take over the Florafaunium arose. While no formal agreement had been signed, board members felt they had committed themselves to take over the institution and therefore they should provide for it in the budget. Also they agreed to the moving of the exhibits to museum headquarters in Bakersfield by including monies in the budget to cover such a transfer. Latta pointed out in the meeting the extreme range in temperatures and humidity in Lebec was ruining the exhibits, saying many of the small-bird displays already have deteriorated until they are valueless and have to be replaced. In the new display in the museum, special cabinets would be built so the humidity could be controlled. The board approved the hiring of a museum technician and a museum helper to handle the moving of the florafaunium and setting it up in the chamber building. The building housing these exhibits in Lebec will not be moved. Nor will all the exhibits be moved now. Latta estimated it would be eight months or more before the displays could be moved and set up in the museum. Costs of operating the museum took up the lion's share of this morning's session. And it ended up with the board granting $2,315 more than the department asked. However, that figure is misleading. The increase came about because of the addition of the florafaunium to the museum. That added $7,065 to the budget. Slashes in the other museum activities brought the increase down to the $2,315 figure. 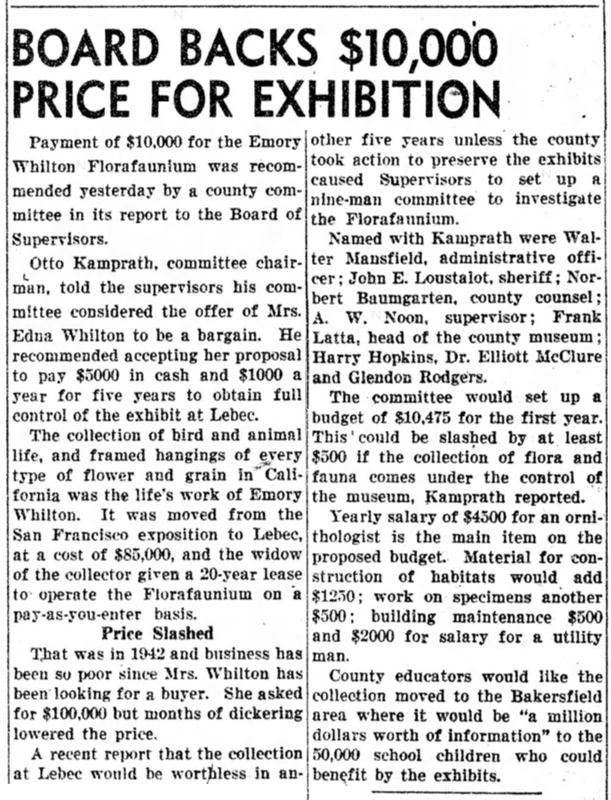 Latta had asked $8,135 for moving and operating the florafaunium but the board trimmed his request to $7,065. This was incorporated into the museum budget. In his lengthy session, Latta got into trouble at the very first over the hiring of the museum technician and museum helper. He finally won his point and they were included in the budget. His phone allowance was cut. Next was a minor furor over a janitor. Latta said the man assigned to the chamber of commerce building could not do the museum too, and he wanted a part-time man. After much talk, the board decided to see if he couldn't get help on it. Bakersfield Californian | July 6, 1955. Demolition of the long unused "florafaunium" building at Lebec has been ordered by the [Kern County] Board of Supervisors. Tearing down of the structure will be directed by the public works department, and the actual work will be done by men from the county industrial farm. Lumber and other material salvaged from the building will be used at the farm. It will be the second time that the building has been disassembled and moved. It was brought to Lebec from Treasure Island in San Francisco Bay, where it was an exhibit building during the exposition of 1940. After being reassembled on a roadside spot in front of Lebec hotel, the building was for years occupied by Emory Whilton's collection of flora and fauna — hence the name "florafaunium." For one reason or another — possibly because of its location — the florafaunium was not a financial success, and after Whilton's death his lifetime collection was sold to the county for a very low figure. Much of the exhibit material was moved to the county museum at 38th and Chester. Because of lack of space, however, a large amount was kept in the florafaunium building to gather dust. Dining these years the county has continued to pay rent for the space occupied by the building. Bakersfield Californian | May 17, 1975. The Emery M. Whilton Florafaunium Collection, a grouping of flowers, mammals and more than 400 birds, sat gathering dust and insect larvae in the Kern County Museum until senior student at Cal State Bakersfield, Phil Sheldon, volunteered his time to refurbish the birds. Sheldon, 30, spent more than five months and hundreds of hours brushing the birds with soft paint brushes and wiping the dirtiest bird feathers with white gasoline. And for all his trouble he received no money. He didn't mind though. The labor of love was part of a biology internship for which he received five quarter units and the thanks of museum director Richard Bailey. Sheldon, who will enroll in a master's program in biology at San Francisco State University in the fall, said he took on the time-consuming task for the experience. "It's a good program because it got me into the real world" (of biological investigation). He plans to be a biological field researcher after he finishes his college training. The Whilton Collection was collected by a Tulare hotel and land owner more than 40 years ago and was purchased by Kern County in July 1950. Whilton and his daughter Ynez catalogued the birds plus mammals and flowers from collections throughout the United States. The animals were mounted by Gus Nordquist of Orinda. Between 1942 and 1950 the collection was housed in the Florafaunium, a former San Joaquin Valley exhibit building at the San Francisco World's Fair which was moved brick by brick to Lebec. The now defunct building sat next to the old Lebec Hotel. However, the nation was at war in 1942 and gas rationing kept large numbers of tourists from visiting the unique attraction, whose name means plant life (flora) and animal life (fauna). In 1950 the county bought the collection for $10,000, though it had once been valued at more than $120,000, and moved it to the basement of the Kern County Museum (then shared by the chamber of commerce). Except for a few exhibits, the collection has been in the basement ever since. 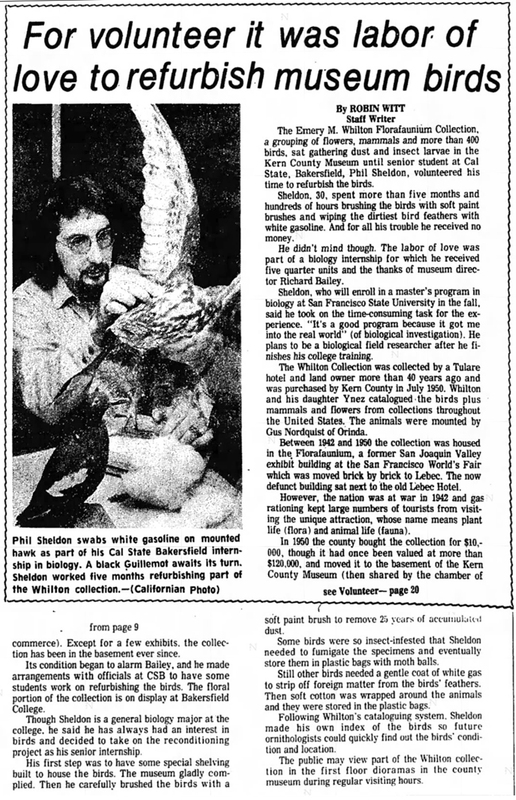 Its condition began to alarm Bailey, and he made arrangements with officials at CSB [California State University, Bakersfield] to have some students work on refurbishing the birds. The floral portion of the collection is on display at Bakersfield College. Though Sheldon is a general biology major at the college, he said he has always had an interest in birds and decided to take on the reconditioning project as his senior internship. His first step was to have some special shelving built to house the birds. The museum gladly complied. Then he carefully brushed the birds with a soft paint brush to remove 25 years of accumulated dust. Some birds were so insect-infested that Sheldon needed to fumigate the specimens and eventually store them in plastic bags with moth balls. Still other birds needed a gentle coat of white gas to strip off foreign matter from the birds' feathers. Then soft cotton was wrapped around the animals and they were stored in the plastic bags. Following Whilton's cataloguing system, Sheldon made his own index of the birds so future ornithologists could quickly find out the birds' condition and location. The public may view part of the Whilton collection in the first-floor dioramas in the county museum during regular visiting hours. Tulare Advance Register | November 5, 2004. There's more than just soup at Tulare's Emerton Club. On the corner of Tulare and K Street in Tulare lies a little piece of history. In 1922, a Los Angeles broker, Emery M. Whilton, opened the Hotel Tulare on that very corner. And, by July of that year, the dining room was open to the public. According to a menu description written by Ellen Gorelick, director and curator of the Tulare Historical Museum: "During World War II, the hotel lounge, called the Emerton Club, was a popular gathering place for cadets from nearby Rankin Field." The hotel suffered a run of misfortune, however. In 1955, it was sold to a national chain, which resulted in the closing of its doors in 1966. In 1983 it was destroyed in an arson fire. The restaurant was restored and opened as V's about 8 years ago, and for the past two-and-a-half years, Carol Rinn-Elkin, managing partner, has been bringing it back to the fine-dining experience of the original Emerton Club. LW3247: Download larger images here. F6714 and W-1457 (lw3247a & lw3247b) from Pomona Public Library collection; the others purchased 2018 by Leon Worden.